Groupe Rock 'n' Roll US formé en 1962 à Santa Ana (Californie) et comprenant Bob Spickard, Brian Carman, BobWelch, Warren Waters et Rob Marshall. 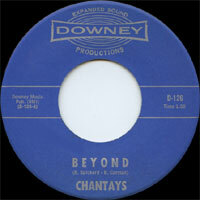 Formed in Santa Ana in 1962, the Chantays were five high school buddies — Brian Carman (guitar, Vocalss), Bob Spickard (guitar, Vocalss), Bob Marshall (piano, keyboards), Warren Waters (bass), and Bob Welch (drums) — ranging in age from 13 to 17. Playing local dances, they specialized in surf music, and at least in the beginning were primarily an instrumental outfit. 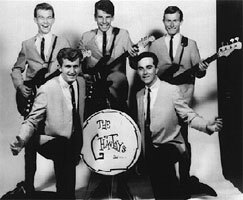 They were spotted and signed up by manager Dale Smallins, and in 1962 Carman and Spickard composed and published a piece entitled "Pipeline," which went on to become one of the biggest and best instrumental surf hits ever recorded. Its simple yet memorable melody and beautiful guitar line — lyrical yet evoking excitement and motion — and deceptively complex embellishments, all backed by a highly animated and propulsive bass part, made it naturally appealing in the musical landscape of the time. Additionally, the record had a very natural sound that made it seductive to the ear. One reason for its success may have been the fact that, so the story goes, it was actually recorded in the back of a particular surf shop (where the original master tape was reportedly found more than 25 years later) — perhaps it was just a practical decision to cut the song there, or they were seeking some kind of psychic verisimilitude, but if it is true, it didn't hurt the finished product one bit. 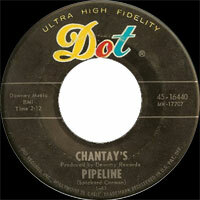 "Pipeline" became a number one single and rocketed the quintet out of Santa Ana and straight to national fame. They followed it up with a brace of singles, none of which saw even a shadow of the sales of "Pipeline," and also cut two albums, Pipeline and The Two Sides of the Chantays. Those were fine showcases for the group's strengths — and a few weaknesses — but made very little impact. Their repertoire was crowded with rock & roll covers and "Pipeline" sound-alikes, as well as some cutesy plays on the Shadows' sound of the same period, and none of their follow-up singles charted. Meanwhile, "Pipeline" not only got heavy radio play for years after it left the charts, but also entered the musical mainstream as a pop instrumental standard (in particular, television viewers who lived in the New York area during the early/mid-'60s may remember "Pipeline" being used almost weekly as background music whenever kids show host Chuck McCann would come out dressed as Ace Jackson, to read the "Smilin' Jack" comic strip on his Sunday television show Let's Have Fun. Competent players who went heavy on the rumbling bass, ghostly reverb, and electric keyboards, the Chantays were very much a one-shot act. The group remained perennially popular on the nostalgia and oldies circuits, with new members coming in alongside of Carman and Spickard, and Welch subsequently rejoined. In 1994, the group released their first new album in over 30 years, called Next Set, and they followed it up in 1997 with Waiting for the Tide. As of 2005, the band was still working regularly.